Lots to see - fun alone, with a group, or as a family outing! Star balloons lead back to the Tours Avenue. 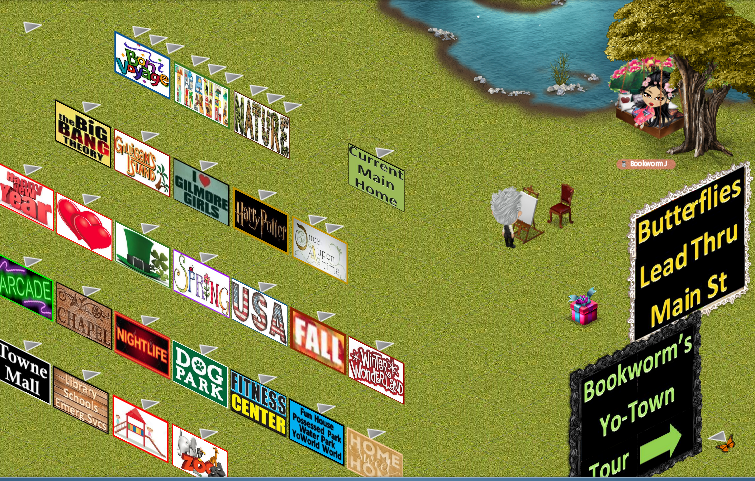 Butterflies always lead to or through Main Street, and everything is connected including Harry Potter, Zoo, Park, Gilmore Girls, Library, Fitness Center, YoWorld World, Theater, Water Park, Schools, and more! Last edited by Bookworm J (129336295) on Mon Feb 18, 2019 1:54 pm, edited 7 times in total. OHMYGOSH a Gilmore Girl place *swoons* off to visit! Prynsess, I hope you enjoy Stars Hollow!! "If time flies when you're having fun, it hits the afterburners when you don't think you're having enough"
Awesome tours! I had so much fun, thank you for the tours. Thank you Tuscany, Luna, and Samantha !! Water Park just completed - visit any time ! i have visited some of your homes! nice decorations! Thank you, Maybe! Visit any time! Wasn't going to do the Pirate theme, but so much fun stuff already and everyone is being so creative!! So - added an "Adventure Island" at the end of the Amusement Park with the Pirate Ship (deck so far) and a Treehouse - interactives of course! Visit when you can!! 27 avenues to Main Street, with 80 homes and 157 avenues making up the town - lots of interactive fun - come wander sometime ! Come and visit sometime! Cool off at the Water Park, visit the Zoo, wander Stars Hollow, relive the Harry Potter books, and more! Tour the updated Diagon Alley! Also available through the Leaky Cauldron, in the Harry Potter section, of course!